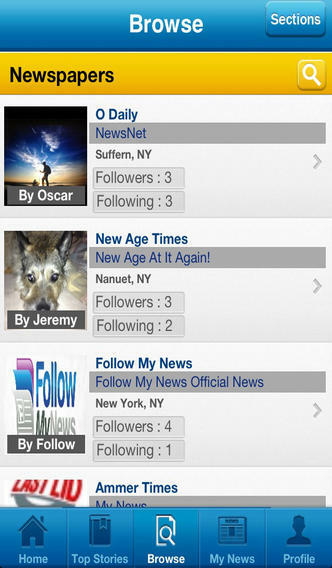 Follow My News is an iPhone app developed by Jarret Ammer / Follow My News LLC. 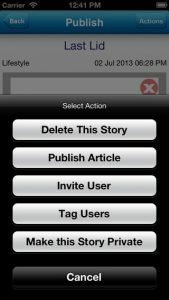 Create your own virtual newspaper, rate the stories which you find most interesting, and communicate with fellow news junkies so you always stay on top of current events. This crowdsourced news platform is a clever way to filter and customize your news feeds. 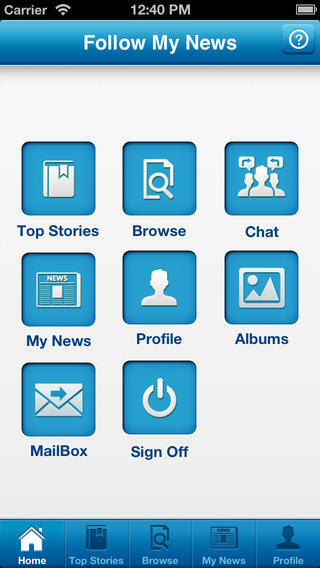 The app is structured around 4 main modules: Top Stories, Browse, My News, and Chat. You can also adjust your profile or view your albums from the main menu. In Top Stories, you can rate, like, dislike, or comment on stories shared by the people you follow. You can also manage your feed subscriptions here. In the Browse module, you can find people to follow by contact info or by the name of a newspaper. You can also track down video feeds and news using a filtered search. The Chat module lets you communicate with other Follow My News users, in real time. 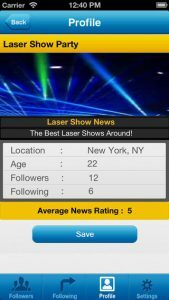 In terms of other social networking options, this app also lets you share interesting news stories via email, Facebook, and Twitter. Arguably, the coolest part of this app is the My News module. Here, you can write up your own news stories, drawing from experiences in your community. You can upload photos, videos and audio into your news stories as well! Whether you’re a news junkie or an aspiring citizen journalist, Follow My News is a great app for news fans of all stripes. If you hate being out of the loop, this clever mobile app can help you stay connected. This app has an awesome interface! Follow My Newsrequires iOS 5.0 or later. Compatible with iPhone, iPad 2 Wi-Fi, iPad 2 Wi-Fi + 3G, iPad Wi-Fi (3rd generation), iPad Wi-Fi + Cellular (3rd generation), iPad Wi-Fi (4th generation), iPad Wi-Fi + Cellular (4th generation), iPad mini Wi-Fi, iPad mini Wi-Fi + Cellular, iPad Air, iPad Air Wi-Fi + Cellular, iPad mini with Retina display, iPad mini with Retina display Wi-Fi + Cellular, iPod touch (4th generation), and iPod touch (5th generation). This app is optimized for iPhone 5.